Blue Sky offers a unique collection of personalized gifts for the whole family. Passionate about eco friendly and fair trade, Blue Sky has a large collection of earth friendly, handmade items. Choose eco-friendly gifts, recycled gifts, or Earth friendly gifts for your next giving opportunity. Unique and quality gifts for all occassions. I was thrilled to review the beautiful recycled wine bottle cheese tray from Blue Sky. This is taking recycling a step further! 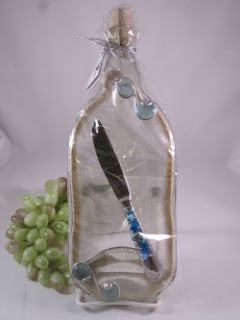 The Recycled Wine Bottle Beaded Cheese Tray is made from a recycled clear wine bottle that's been flattened. It's functional art made from recycled goods. The wine bottle is beaded with aqua glass gems and wire wrapped. Has a small amount of sand inside to give it a beachy feel. Comes with a beaded spreader. Made in the USA. Place your soft cheese on this unique recycled glassware, and use the beaded spreader to put it on your crackers or pita bread. A conversation piece for your next get together. Rest nicely on the counter, perfect size for your cheese spread. Utilize it for decor in your kitchen when you are not using it! I just love to decorate with upcycled, or recycled kitchenware in my home. That's beautiful. It would make such a nice wedding gift, or birthday too. It's great that it's made in the US. I would love to see how these are made. I would love to have this cheese platter. I went online and found the Hacienda Decorative Handmade Metal Lantern which I love also. Truly some beautiful items there. I love the it's beautiful AND practical. What a great idea! I love the extra bling added by the gemstones...and the cork left inside. The whole piece looks so elegant. so gorgeous!! such a beautiful way to recycle- i love the adornments too! they have some wonderful products- i will definitely be checking them out for a friend's upcoming wedding!! thanks! There are many great products to choose from at Blue Sky Collection! I love my recycled cheese tray! that is a really fun tray to pull out for parties plus we love cheese!